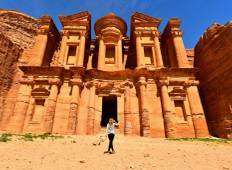 Find a Adventure trip that explores Israel And Jordan. There are 26 tours to choose from, that range in length from 3 days up to 22 days. The most popular month for these tours is August, which has the most tour departures. "Very happy with the guide & driver Amer, who took good care of us and gave us large..."
"I already wrote everything i wanted to say lmao"
"This was a great trip! 3D 2N in Jordan for the price we paid was great. We had a..."